Probably the single most important thing we can do for ourselves when we are unwell is drink more water. But not only when we are unwell. 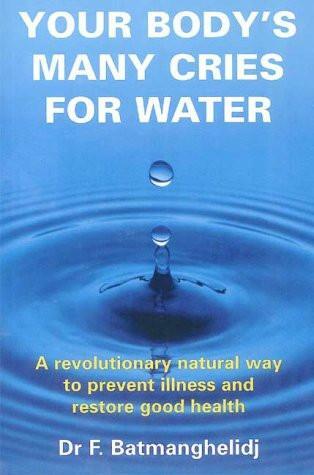 We need water, lots of water, to keep us well, says Dr Batmanghelidj in his best-selling book Your Body’s Many Cries For Water. Read it, if you can get hold of a copy. But in brief, he tells us that our bodies require an absolute minimum of six to eight 8-ounce glasses of water per day. And that means water, not coffee or tea, or fruit juice, or any other beverage. Water, plain and simple. These six glasses would ideally be drunk as follows: one half an hour before each meal, and one two-and-a-half hours after each meal. But that is the minimum, remember. We should also wash our food down with some water, and drink more water whenever we feel thirsty. Not only when we feel thirsty, though, but also when we feel hungry for a snack outside our regular meal-times: the body, especially as it grows older, becomes incapable of distinguishing thirst from hunger. While young people, who do know when they are thirsty, tend to quench that thirst with rubbish instead of water, many older people don’t believe they are thirsty at all and if given a glass of water just sip at it, merely wetting their mouths and throats and convinced that that is all they need.